At Excel Machine & Tool, Inc. we specialize in the fabrication of tube bending equipment. 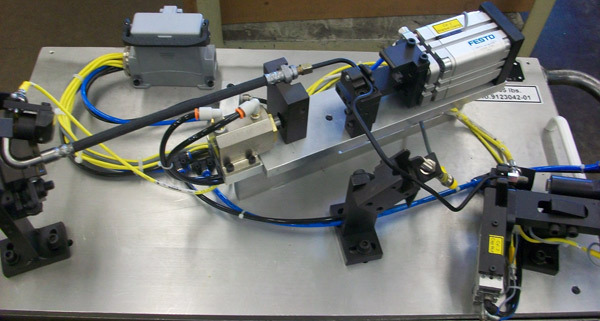 As a full service company we also support our customer with custom fabricated ancillary systems and test equipment, this service is exemplified with the torque and leak test machine highlighted here. A customer in the automotive industry was in need of a system that could quickly and effectively test formed tube assemblies for leaks. Their specifications required that the system be easy to operate, with quick fixture change over. This project represents a ground up design, engineering, and fabrication effort. Once a design was established, we developed the operations and control systems. The machine is run by an Allen Bradley PLC system, with pneumatic valves by Festo, and a torque controller by Atlas Copco. The leak test controller is a Cincinnati Test Systems, Sentinel I28, all of which was operated through a Maple Systems programmable interface. These advanced systems required a functional precision machine base, with robust features that would support heavy duty use. The machine base was formed from square as well as 5/8″ thick hot rolled steel plate. The guarding consisted of 16 gage sheet metal with panels made from 16 gage expanded metal, framed in C-channel. The fixture base was machined from aluminum, and the tooling was made from a combination of heat treated hot rolled steel, 1018 steel, and A2 and S7 tool steel. Fabrication utilized a number of our precision capabilities, such as CNC milling, turning, precision grinding, and welding. The precision of these processes are verified by comprehensive quality inspections throughout manufacturing and assembly process. We also provided a number of coating applications such as powder coating, painting, and black oxide. The finished test machine features a compact 40″ x 36″ footprint, with adjustable parameters for torque and leak test controllers. Utilizing our advanced capabilities and cutting edge systems, this test machine achieved 20 second cycle times, with 2 seconds for tooling operations, 10 seconds for the leak test, and 8 seconds of operator duties. The entire project, from concept to delivery was completed in just 8 weeks.